For the full symposium programme, including the educational presentation offerings, please click here. Thank you for your willingness to present on a topic in the field of group work to the IASWG diverse membership. Your expertise and commitment to further the profession's body of knowledge are a key component of how we advance the goals of our Association. Presentations are presented for 30 minutes (two per room totaling 60 minutes). A volunteer room facilitator will be assisting with managing the time. Poster sessions: are visual representations of research, practice, or training initiatives and are displayed at designated times during the Symposium. The space provided for the display of posters is 46 x 46 inches. Thumb tacks will be provided to hang your poster. To learn more about poster presentation guidelines and recommendations, click here. Data projector for visual presentations, video and music (projects either video or information from a connected computer). The Main Hall and Auditorium have PA systems. The breakout rooms have loudspeakers to play sound through the computers. If you plan to display a PowerPoint presentation, it is easiest if presenters bring their own laptops. With this said, IASWG will have laptops available for use. Wireless Internet Connection: Free wifi is available in the conference venue. It is sufficient to surf the internet and connect to your email; however it can be slow if you plan to download or upload large files. VGA connectors are available for laptops. Please note: If you are utilizing a Macintosh device or Windows laptops with only HDMI ports, you will need to bring your own converter cable/adapter. The Conference Center does not provide any MacBook, Mac, tablet, or iPad adaptors (e.g., VGA, HDMI). Again, all such items should be furnished by the presenter. There is a strong mobile phone signal is available in Skukuza Rest Camp. Attendees will need to make their own arrangements regarding international roaming with their service providers prior to leaving their home countries. Alternatively, sim-cards for use on the South African networks can be purchased at Oliver Tambo International Airport. The largest South African network is Vodacom (a subsidiary of the British Vodaphone). Other possibilities are MTN or CellC - all networks have different phone and mobile data options available. We highly encourage you to email your presentation materials, including handouts, to [email protected] to be shared in the Resource Library to provide attendees with the opportunity to electronically access and download the information. Attendees who wish to print hard copies of your handouts will then have the option. If you choose to provide printed handouts for your session, we recommend printing 25 copies. IASWG is proud to be a multinational, multicultural organization. The annual IASWG symposium is primarily conducted in English, but we ask presenters to be aware that many participants are using English as a second language. It is especially important, then, to ensure that presentations are accessible to everyone. Our general communication principle is one of inclusivity – to make sure that your presentation speaks to everyone and can be heard by everyone. Be aware that speakers who do not speak your language may be in attendance at your presentation (and, possibly, people with hearing problems). At the beginning of your presentation, invite a quick overview of your audience – in particular, their international background and first languages. Introduce your country and your city or region (perhaps show these on a map with pictures). Be aware that some people in your audience might never have heard of your location. Speak loudly, clearly and ask if everybody is able to follow the content. Make breaks for peer-to-peer translation and mutual aid in your group. If you use acronyms or specific terms, please explain them and spell them out. It is likely that many people in your audience will be unfamiliar with acronyms and terms that you might take for granted. Be aware that even academic degrees are described differently in different countries. Please explain and give context. Rooms will be arranged in row seating and/or in circular tables. If you move the chairs during your session, please return them to the original setup after your presentation. A volunteer will be present in the room to assist with the room arrangement. All presenters must be current members of IASWG. All presenters must pre-register for the event. Presenters can register for one-day if they only plan to attend the day of their session. We encourage you to include IASWG colleagues as co-presenters of your session as a way to enhance your presentation. It is the lead presenter's responsibility to inform any co-presenters of any pertinent information such as the schedule, membership, and registration requirements. The lead presenter is the IASWG's contact person; all correspondence related to an educational session will be routed through them. 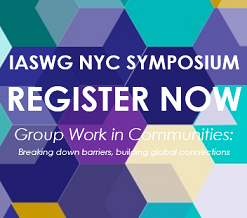 All confirmed lead presenters and co-presenters must register for symposium by the deadline designated by the associated IASWG’ contact person. Co-authors may be recognized for their contributions to poster presentations, but only registered presenters will be allowed to attend the Symposium. Non-registered authors and contributors cannot present in any capacity. To learn more about poster presentation guidelines and recommendations, click here. Poster sessions are visual representations of research, practice, or training initiatives and are displayed at designated times during the Symposium. The space provided for the display of posters is 46 x 46 inches. Thumb tacks will be provided to hang your poster. To learn more about poster presentation guidelines and recommendations, click here. References - Please list citations of references utilized in the submission for the presentation. Printed Program Description - Provide a brief session description (up to 75 words) for inclusion in the symposium program and on the IASWG website. IASWG will use photographs and video taken during events to promote the association and future events. By presenting an educational session you provide IASWG with the unrestricted right to use photographs and videos at its discretion for this purpose.